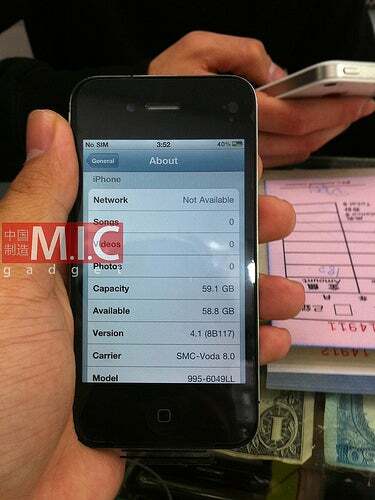 64GB iPhone 4 Prototype Leaked? Are you sick of iRumors yet? Well here's something that doesn't quite fit into the ol' rumor mill: M.I.C. Gadget (stands for "Made In China") blog has gotten its hands on an "engineering prototype" 64GB iPhone 4, and has written a Gizmodo-like exposé of the product. Right, this is not quite an iPhone 5, but hopefully it'll tide you over until the white iPhone 4 comes out (although, according to M.I.C. Gadget, the white iPhone 4 is also on sale in certain markets). Anyway, this 64GB capacity iPhone 4G appears to be the real deal, at least according to M.I.C. Gadget's hands-on. The "engineering prototype" has popped up in Sin Tak, the "greatest grey market in Hong Kong." For those of you who are wondering, gray markets are like black markets...except the goods being sold are legal. The phone doesn't say it's a 64GB version--instead, it says XXGB on the back (though a look at the phone's OS will tell you all you need to know about its innards), similar to Gizmodo's stolen--err, borrowed--prototype from last year. M.I.C. Gadget takes this to mean that the phone is actually a prototype from Apple. The phone also shows other little "prototype" signs, including no plus/minus signs on the volume buttons and no silver ring around the camera lens--features that Gizmodo's prototype also lacked. M.I.C. Gadget says the owner of the prototype purchased the phone from a source with a "small quantity" of these prototypes, and that the phone is "definitely leaked from Foxconn's factory in Shenzhen." The blog also suggests that perhaps this means Apple will not be bringing out an iPhone 5--maybe they'll just update the iPhone 4 incrementally. As I said earlier--I'm not sure where this 64GB unicorn fits into the rumor mill, but the idea of small updates to the iPhone 4 is an idea. After all, Apple just brought out the iPhone 4 on Verizon, and there's still no white iPhone 4 anywhere (except in China, apparently)...so maybe they're not ready to drop an iPhone 5 just yet.